About time I updated this site ! I do keep Flickr up to date. For now I have listed below all instuments that are either finished or finished in the white. See the Bench pages for anything in the making. I will try in future to keep things more up to date ! I am busy making - not so busy creating HTML ! Recently finished ( Oct 2010 ) . Back of very old Bosnian maple, ribs English sycamore. neck European maple. Willow blocks, spruce linings. Ebony fittings - with Box pips and fret. Dominant med gauge and a Hill E. Hand cut ebony fingerboard. Cooked oil varnish. Weight without chinrest 425 gms. Back over arch 353mm. Teller bridge. Nut 24.2mm - String 330mm. A violin after Guarneri del Gesu 1733 - ex soil. Back neck and ribs from very old Bosnian maple - all from the same source. 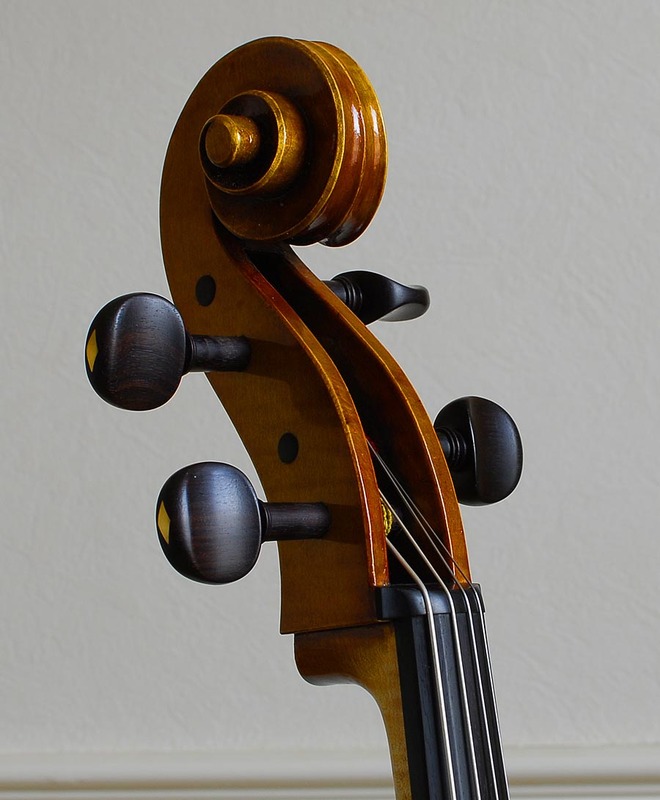 Hand cut ebony board - strung at present with medium Dominants and a Hill E. Ebony fittings. Weight without chinrest 405 gms. My own oil varnish - a light golden brown. A De Salo model Viola 16 1/2"
Back old Bosnian maple of a very wild grain - with maple ribs and neck. My own oil varnish. Rosewood fittings with bone pips and box fret - fitted Eva mediums with a larsen A. Currently fitted with a kevlar tailcord ( fitted up with a twist in the pics - now set up straight ) Titanium fine adjuster. Weight without chinrest 560 gms. ( Over arch) 204 - 138 - 240. Length 420. Neck 151 - stop 224. String length 378. Fingerboard 315. Rib height pin - 36, 37.2, 36.5, button 35.5. Width nut 24. This is the instrument I was rebushing | gallery pics Bush and Final Scroll | It is the instrument I started in 1987 - and its completion was the touchstone for my returning to making instruments. Based on the Servais reduced to 750mm body length. Back and ribs European maple - neck Scottish sycamore. Table Alpine spruce. Fitted Larsen A and D - Spirocire C and G. Fine hand cut bridge from aged maple. Wittner alloy tailpiece. Ebony swiss pattern pegs. Cooked oil varnish. A Cello after Guadagnini in poplar - finished and set up with Lasen A and D - Spirocore G and a Prim C.
see Flickr sets - Guad cello. 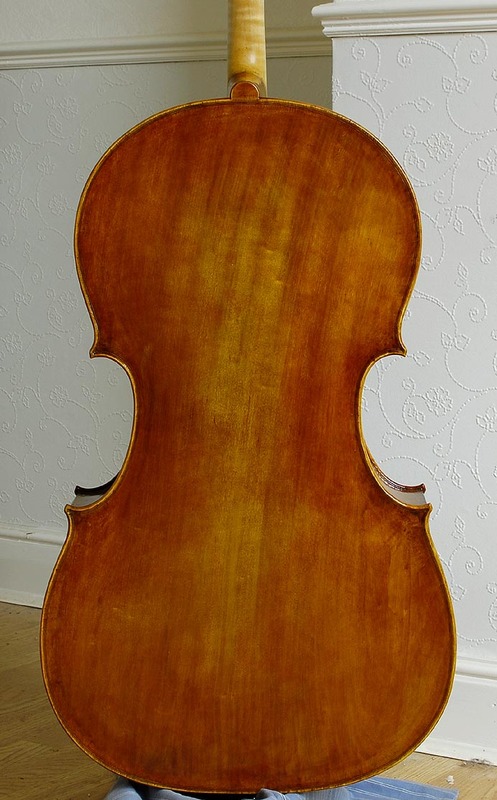 A Violin after Bergonzi - see bench pages, Now finished - images to follow. 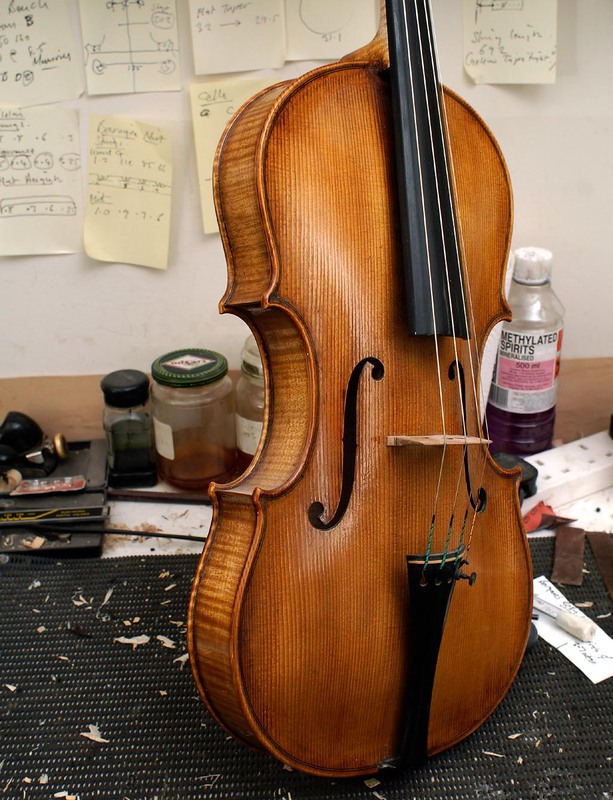 A violin based on the Viotti Stradavari - Finished and just being set up for the first time. Images to follow or see above flickr link - sets - Two New Violins. 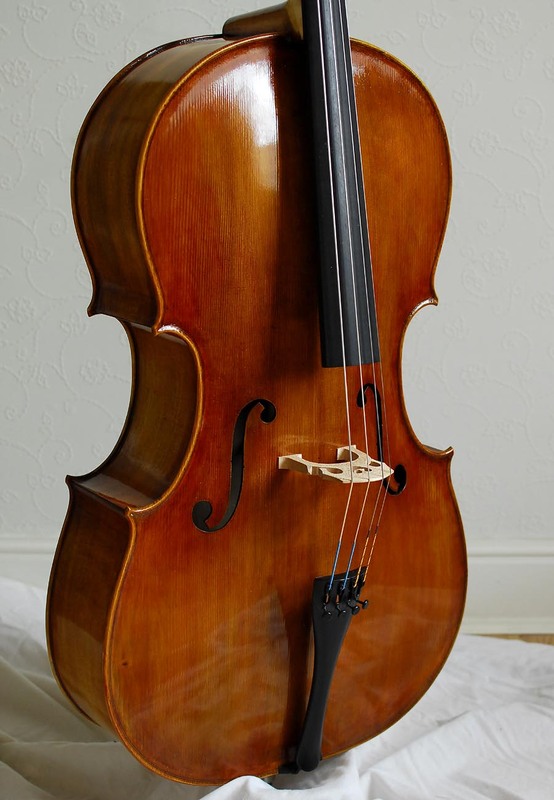 A Guadagnini model Viola - Finished and set up with Dominant forte. A Long Pattern Strad - SL mould form Currently being varnished. A violin based on the Countess of Polignac Stradavari - Finished in the white. A Rugeri violin of 1686 - Just started the ribs ! See Bench pages for instruments in progress info.